Despite German poker pro Kagome Kagome’s real name being unknown to nearly all of the poker community, he has still managed to secure a reputation as one of the best young hold’em players on the planet. The 21-year-old, who said he wants his identity to be withheld, has garnered respect from Team Full Tilt’s Patrik Antonius and Phil Ivey. Ivey recently told the German in the chat box: I think we both know you are better than me at [limit hold’em]. Kagome Kagome was one of the biggest winners in 2010, earning about $2.5 million in limit hold’em, and his success gave him the confidence to ask Ivey for higher stakes in early December. Ivey was responsive to the requests of the German limit hold’em specialist, and it took only a few days before Full Tilt had created a $3,000-$6,000 table for its young online sensation. Card Player caught up with the limit hold’em whiz kid for an exclusive interview to talk about Ivey’s comment, the new $3,000-$6,000 tables at Full Tilt, and the state of limit hold’em today. 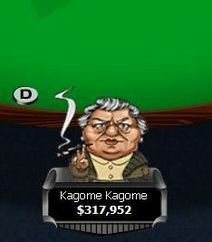 Note: The German changed his Full Tilt Poker screen name from “IHateJuice” to “Kagome Kagome” shortly after this interview. Brian Pempus: Ivey had kind words for your skill set in limit hold’em. Do you think you are better than him in the discipline? Have you ever considered playing against him live? Kagome Kagome: I don’t consider it that surprising that he told me I was better. I think Ivey is the best overall player of the world, but even he can’t be perfect at every single game. However, even if I was, it wouldn’t mean anything. Poker is a fast moving business and a few months’ results will be forgotten in the long run. Unlike me, Ivey has been on top of the game for years now. His aggressive style is hard to handle, because he won’t let you win any pot unless you either have a pair or a decent amount of experience against his kind. Playing live against Ivey would be quite the challenge. BP: Why did you ask Ivey for higher stakes on the Full Tilt client? Did you think Full Tilt was going to oblige you? What goes through your mind during the swings at these stakes? KK: The higher I play, the bigger the thrill I get. Most of the fun I had playing poker came moving up the limits. If I can’t move up, I will stop playing. I can’t imagine any stakes I wouldn’t consider playing. I wasn’t sure at the beginning if Full Tilt was going to give me what I asked for, but after Ivey showed his interest it was clear that I would get what I wanted. However, when they created one single ring table for me, they just gave me a reserved seat. That was actually a disadvantage because I could neither chose my position nor play two tables at the same time. So I asked them to change it and create more $3,000-$6,000 tables. I consider my bankroll to be my gaming capital, and it has no impact on my personal life. Temporary swings are to be expected and don’t affect me much as long as I don’t need to move down the stakes. BP: Can you talk about the marathon matches with Patrik Antonius? Has he been your toughest opponent this year? Have marathon matches been the norm for your poker career so far? KK: Playing against Patrik is really exhausting, but I love it. It’s like a roller coaster ride. One week I lost a million dollars, and then won it back the week after. You never know what happens next. The swings can be enormous in limit hold’em, especially when the edges are small. Against players of a similar skill level the cards will completely dictate the outcome of the match. Knowing this is crucial, because especially in limit hold’em the variance is very high, and it’s hard to remain completely unaffected. But that applies for every high-stakes game. Antonius has been by far my toughest opponent, mainly because he is running too well! I started my poker career by playing ring games and had moderate success. When I moved to heads-up I was able to grind my way up step by step. Most of my winnings were earned in huge marathon sessions, sometimes lasting several days. Normal sessions often turn out to last long when both players have a reason to play on, either having a decent edge, being stuck, or just being in the mood for the gamble. I am no different. In sessions lasting more than six hours you will nearly always see at least one player go on tilt, and sometimes both. You have to just make sure to tilt less than your opponent. BP: What does it take to be a good limit hold’em player? What makes you so successful? Do you have a grinding schedule? KK: Mental stability is very important because in limit hold’em you can’t have a big edge over your opponent. Normally the cards will decide the winner. It’s all about winning the extra bet in the long run. That can be pretty exhausting at times. My advice for up-and-coming players is that in limit hold’em it’s hardly ever right to fold a pair, because the odds are very good. So relative hand strength changes a lot compared to big bet games. I personally don’t excel at anything, but I have good fundamentals. That makes up for quite a bit. As long as I see room for improvement, which at this point I do, I don’t consider myself the best. I know at least a few players I can still learn from in the future. I also don’t have a poker schedule or anything like that; I completely fail at scheduling. So I have to take things as they come. BP: Can you describe the current state of the online limit hold’em game? Also, do you see yourself branching off from the virtual felt and playing in World Series of Poker limit hold’em events in the future? KK: When I move down to the lower limits the game seems surprisingly lively. All I want is for players to be less greedy and care more about the health of the game. Things like sitting out in an instant, once the fish does, can make him feel uncomfortable. Same goes for angle shooting and bum hunting. Most recreational players are more inclined to join a game that’s already running. It’s all about creating the right atmosphere. It’s also funny how people always say they have to leave in 30 minutes, but then continue to play another twelve hours! I will definitely be around during the WSOP, mainly to meet other players and have a good time with my friends. Eventually I will play a few events too, but I don’t have much experience live and it’s not much fun for me either. I hate waiting for cards and I always need something going on. Even online I find myself browsing the forums or watching something during play. Card Player would like to thank Lutz Enke from PokerStrategy.com for help with contact information. "The higher I play, the bigger the thrill I get. Most of the fun I had playing poker came moving up the limits. If I canâ€™t move up, I will stop playing. I canâ€™t imagine any stakes I wouldnâ€™t consider playing." Kid will be broke in 3 years. Learn bankroll management. So I asked them to change it and create more $3,000-$6,000 tables. I consider my bankroll to be my gaming capital, and it has no impact on my personal life. Temporary swings are to be expected and donâ€™t affect me much as long as I donâ€™t need to move down the stakes. I assume he is well off in his personal life, so he does not need to worry about the BRM??? "My advice for up-and-coming players is that in limit holdâ€™em itâ€™s hardly ever right to fold a pair, because the odds are very good." He's talking about heads-up play, right? "Note: The German changed his Full Tilt Poker screen name from â€œIHateJuiceâ€ to â€œKagome Kagomeâ€ shortly after this interview." This is odd. I thought you couldn't change screen names on Full tilt. Anyone else know? FT prop didn't want one of their up and coming nosebleed players having a anti-semitic sn. Juice sounds a lot like Jews. the double whammy is that the kid is German. Strange they would give special treatment to someone like that. MBN I guess. He's not getting special treatment. Not in a good way anyway. They made him change his name. I'm sure he'd rather keep the old one that he originally chose. This is a case where him being well known actually worked to his disadvantage. If he was a .10/.20 player I'm sure they would let him keep his name. I don't know what you think "MBN" about FTP telling you that you have to change your name. Why consider all the facts when you can just complain though? Odd. Only facts I have are this article and Full Tilts site rules. Hence why I asked the question genius.